January 13 was a big day for us because we bought two things for the house. Are your recent purchases as frivolous as mine? Since December 2009, we really haven’t bought anything for ourselves, for the house or for anyone else. We were never big spenders, but we’ve wasted our share of money through the years. How often do you buy something that really doesn’t benefit anyone in any way? I still feel like our spending is out of control, but we rarely buy anything. How can that be? Eating out. It’s not really shopping, but it is consumerism. We eat several meals out every week, but it’s always value menu items, free items from coupons or other discounted offerings. What we eat may not always be healthy, but it’s always cheap or free. Financial, we’re doing okay with this, but we don’t always get the healthiest fare. Groceries and personal care items. We go to Aldi (a grocery store) every week and to Walmart for groceries and related items a couple times a months. Aldi is a nice shopping experience because it is small, quick, organized and quiet; Walmart isn’t because it isn’t. Books for resale. I still run an online used bookselling business, a major source of income for me, so I have to shop every week for more inventory. This includes new and used bookstores as well as thrift stores. I haven’t bought any new clothes this year, and I’m still dressing as well as I ever have. (My standard for clothes is very low.) I might have purchase a thrift store shirt or two in early 2010, but I don’t remember for sure. Raiding my closet produced enough clothes to get me by. I’ll have to buy some new jeans soon, but I’ll be able to honestly say I need them when I buy them. We bought David $20 in thrift store dress clothes because he planned to go on a couple of job interviews, but after some discussion, we decided that if he got a job, we’d need a second car, and the substitute teaching work he was considering didn’t pay well enough to justify that expense. But he’s still getting some use from the clothes. We also bought him a new pair of jeans last week since he was down to only one that didn’t have holes in them. An Igloo cooler to replace one we had to throw away. It allows us to carry tea and water when we go out, saving us money and time and keeping us hydrated. We don’t use it on every trip, but it often travels with us. A $15 splurge. Electric hair clippers to keep me looking my best without spending money at a hair salon. We’re even doing David’s with them now, and they work perfectly. A $20 excess. And the two items we bought on January 13? A new atomic clock with thermometer. Since the outdoor thermometer was off by four degrees on our old one and the clock changed time zones most evenings, we decided to replace this item. It serves as the official timekeeper of our household and also lets us know when we need to run water to protect pipes and when we’re wasting heat inside. At $25, this is the closest thing to an indulgence we’ve bought. A mattress topper. This thin piece of foam makes up for about ten years of age on our mattress and saved us the hundreds of dollars we would have spent replacing the mattress. A $19 extravagance. Sure, we’ve bought a few concert tickets and perhaps a magazine or two, but it has really been a year of very tightly controlled spending. Amazingly, we’re living well, and we’re doing it with very few new items and fewer old items than ever before. Are you living the same way and feeling the same benefit? Do you feel your spending is slightly out of control anyway? A cooler, some clippers, a clock and the topper make four. How many items have your bought for your home and yourself in the last year? 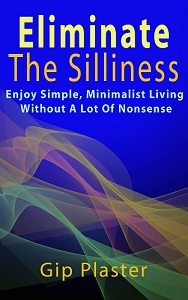 Stopping useless spending is part of a simple, deliberate life. I’m on the right track, but there must be more I can do. That is the catch, isn’t? There must be something more. I drive myself crazy with that thought. I think we do pretty well with the choices we make as to how we want to live (your eating out is a choice, which you are entitled to make! I buy lots of organically grown food, my choice). I am getting to the bottom of what I can be thrifty on. But maybe it isn’t about being frugal, is it? Simple lifestyle… Can you tell I am a new reader? Welcome, Patricia. I’m glad you’re here. I hope you’ll be commenting often. Being frugal is part of the equation at time. Other times, it’s being extravagent just for the experience of it. Devote time and energy to things you’re passionate about — and avoid spending time or money on things you don’t care about. I love that the ad that showed up in my RSS reader was for memory foam mattresses. 🙂 Speaking of things I don’t need…. Most of our extravagance around here is food. I’m trying to morph eating at restaurants as a treat into eating fancier stuff at home as a treat – it’s not working as well as I’d hoped, but I think we’re making progress. A seriously productive round of decluttering over the weekend has me in good spirits overall, though. Have a great day, Gip! We sometimes eat out so often that it isn’t enjoyable, and since I’m a good cook, I don’t know why I can’t manage to cook more often. But… I’m getting better all the time. And with an ice storm in progress here in North Texas, I’ll be home for a couple of days with plenty of time to cook and declutter. Ads on a post about not buying anything are a strange thing, aren’t they? I’ve always had ads on the site, and people always click on them, so I suppose they’re serving a need. I can’t even imagine shelling out for a new mattress, although I could probably use one. I don’t like memory foam, though. I don’t like rubber that fights back. That’s amazing. I can’t see how we could get out eating-out budget down that low. When you work at home as we both do — and live several miles from anywhere — the change of scenery to a nice urban restaurant is essential. Still, we’re spending less on it than we used to, but I’m not so sure we’re eating as well as we’d like. Now, about low income… I wish I could offer some advice, but mine isn’t all that great at the moment. We’re still making it, though. So it would seem we have very similar goals these days; interesting. We have only purchased a new journal this year. It’s amazing when you cut out the clutter of constant commercial noise and cut off the emotional static of shopping when you’re bored its amazing how your desires simplify. I imagine it might be tougher on people living in larger cities, but we are refreshingly simple around here, Wal-Mart and a simple outdoor shopping area are it; the latter mostly filled with tourist baubles, don’t need those and the former we use to get the basic consumables, and even those we’ve learned to simplify. We really have nixed the eating out budget other than occasional round of very fresh local poultry and seafood combo organic stirfry rice (eaten on a lava rock bluff; bliss 🙂 Seriously though, we have been really grateful to find that the more we simplify the more our desires simplify and proportionately our happiness level raises. Hope you guys happily weather the storm and enjoy some good home cooking coziness! I’m loving that topper! And I also don’t have a problem with Walmart, although many people do. It’s not very many, however, because their stores are always full. People respect them for offering fair prices — perhaps without thinking about how they can offer such good deals. Aldi is a great grocery store addition around here in recent months. It’s a much simpler shopping experience than Walmart, but many things aren’t available there. I thought I didn’t spend much money and then I read this post. I could certainly cut down further than what I do spend, but a lot of what I would cut down would be food. My girlfriend and I may get to eat out once a month – and that includes fast food. We aim to eat fresh foods and meat, preparing meals ahead if we must have something to go. Our big expenditures have involved trips to visit family and friends, and one romantic getaway. Maybe in 2011 I can cut back closer to your levels of spending. I’d like to get away for a couple of short car trips this year. We took a brief trip early last year and haven’t really been anywhere since. Wow I’m impressed! I’m glad I found another fellow Aldi shopper! We love them (specifically their prices). I’m glad that you are still having some fun (concert tickets) because cutting all that out can be very depressing I imagine. But I commend you and your family to sticking to that plan! Awesome work! Aldi is new here, but it has really cut my grocery bill. I love live local music. While I spend more on eating out than on music, it would better reflect my values if I spent more on music than fast food. Just purchased a rug due to second born rendering it unsuitable for further use – don’t ask. But we bought a cheap one as likely that he will do the same again in the future…. having kids can be expensive! I’m still in the de-cluttering stage, and am actually planning a few purchases of some less-bulky furniture to replace pieces that are way too big for the space they are in. So I will be spending money to get where I want to be, and will then donate all the old items to charity. Gip, I wonder at your choice to go for cheap or free bad food, just because it’s cheap or free. I eat simple foods (mostly meats, eggs and veggies), but the money I pay for them support things that matter to me like my health, the animals well being, and some income for the farmers that are raising the animals and veggies. Isn’t that part of minimalism; not spending on consumer goods so you have money to spend on what matters the most to you? Hi Gip! This is my first visit to your blog and I think it’s great. Thanks for joining the conversation here, Jenny. You have a great looking blog, and I look forward to seeing it fill up with meaningful content. I’m glad you’re here now.